Sussex return to action in the NatWest T20 Blast on Thursday when they take on Hampshire at the Ageas Bowl (7pm). The squad of 14 is boosted by the return of fast bowler Tymal Mills, who has recovered from a hamstring injury having tested his fitness on Tuesday in a second-team T20 game against Somerset. Head Coach Mark Davis said: “Hampshire are a strong side but we have done well at the Ageas Bowl in the past and it would be great for confidence to get our first win there and build on it. 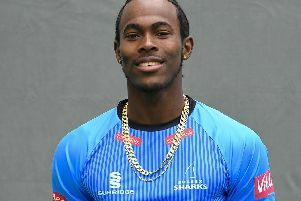 - Hampshire have tasted victory in 10 of their last 11 matches versus Sussex Sharks; winning the last three in succession. - Hampshire have won five of their last six at home to the Sharks; the visitors winning the last such fixture however. - Hampshire have claimed victory in four matches on the trot ahead of this contest. - Mason Crane (Hampshire) has the best economy rate of any bowler to record 10-plus overs this season (5.4); he’s only been hit for four boundaries across his 12 overs.